The Patriots are world champions once more, but in what seems to be a recurring problem, the team had yet another postgame problem to deal with. 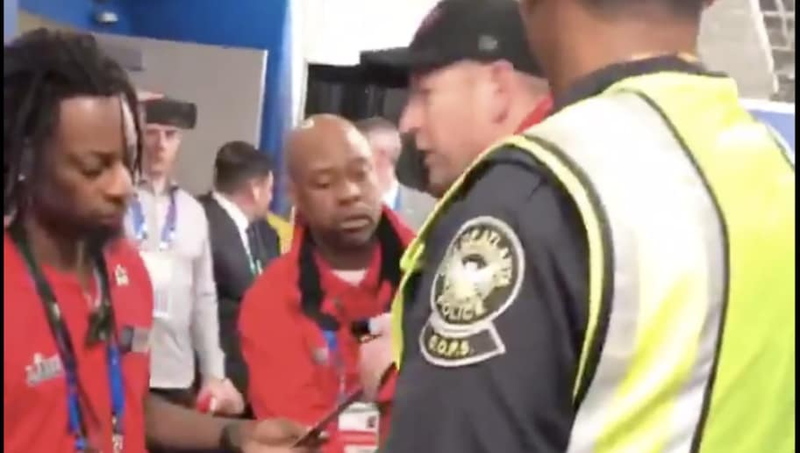 Video has emerged of an unidentified spectator that wore stolen clothes to impersonate a security guard attempting to sneak into the Patriots locker room only to be denied by nearby staff. Looking back at previous Super Bowls, one can recall the famous incident when a fan stole Tom Brady's jersey from the locker room, another situation that shows that while the Patriots have all the protection necessary on the field to claim six Super Bowls, their security is not quite as strong away from the field. Brady and the Patriots didn't let the fan interference damper their celebration, though, as the team still managed to celebrate their victory in any and all ways, including by handing out 50-year-old cigars. Robert Kraft is in the locker room handing out 50-year old cigars. The Patriots, tying the Steelers for most Super Bowl wins for a franchise with their victory over the Rams, will now have to face a litany of questions in the offseason, including regarding the future of tight end Rob Gronkowski. That may suggest an uncertain future in so many ways. But for now, all this team is concentrated on is basking in some Super Bowl glory once again. For the second time in three years, the Patriots are on top of the football world.